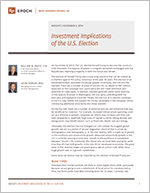 Investment Implications of the U.S. Election - Epoch Investment Partners, Inc.
On November 9, 2016, the U.S. elected Donald Trump to become the country’s 45th President. The balance of power in congress remained unchanged with the Republicans retaining a majority in both the House and Senate. The election of Donald Trump was a surprising outcome that can be viewed as a rebellion against the policy consensus of the past 30 years. The election of an antiestablishment candidate introduces greater uncertainty and risk into the markets. There are a number of areas of concern for us, based on the rhetoric espoused on the campaign trail, particularly the anti-trade sentiment and potential for trade spats. In addition, markets generally prefer some diversity in the balance of power in Washington, not one party controlling both the executive and legislative branches. Finally, the election of a populist candidate in the U.S. may bolster the support for similar candidates in the European Union, introducing additional uncertainty into those markets. On the flip side, there are a number of potential policies and initiatives that may be beneficial for investors. For example, looser fiscal policy could act as a stimulus to growth, corporate tax reform may lead companies to repatriate huge sums of capital currently sitting abroad, and deregulation may benefit sectors such as financials, health care and energy. Ultimately, the election has not changed our core outlook for diminished global growth prospects. We are in a period of secular stagnation. Much of that is driven by demography, and demography is, in the end, destiny. GDP is made up of growth in the workforce plus productivity growth. Measured productivity growth in the U.S is currently running around zero. Growth in the workforce is somewhere between 1% and 1.5%. Combined, this shows why we have been saying for some time that 2% (GDP growth) is the new 4% for developed economies. The good news is that wages are growing at a rate of 2% to 2.2%. While not a huge growth rate, it is growth nonetheless. President-elect Trump’s policies are likely to mean higher bond yields, principally because we are going to see a substitution of fiscal policy for monetary policy. First, real bond yields have been trending down for 30 years. Currently, real yields are touching zero and we believe the chances of that continuing are small. We will likely remain in a lower-for-longer rate environment, but it is unlikely that we will the see the yield curve shift down again. What is more likely is that there will be modest increases in the short end and, depending on how much debt is needed to finance some of Trump’s stated plans, you could see a rise in the long-term rate as well. The market is still pricing in a 78% percent probability that the Federal Reserve will hike rates in December and this did not change much in the closing days of the election or following the outcome. We are likely to see some fiscal policy expansion, which would result in 10-year yields rising. In this type of environment, the U.S. dollar could appreciate. We believe that most other central banks will remain on hold for some time, so a Fed that is in a modest rate-hiking cycle could benefit the dollar. One factor that will be important for determining monetary policy is the composition of the Federal Reserve Board of Governors and there will some important changes to it over the next year or so. The first change would be to the Chair of the Board. Current Chair Janet Yellen’s term expires on February 3, 2018. President-elect Trump had been highly critical of her during the campaign process. It is unprecedented for a sitting chair to resign following a change in government, so we do not think that will happen, but it is also unlikely that she would be reappointed for another term. Additionally, two of the seven positions on the board are currently open. Given the Republican sweep, it is likely that the President’s appointments would be easily confirmed and those nominees should tend toward the hawkish side. Overall it appears that we will be in an environment where both the long short ends of the yield curve will likely be going up (modestly) coupled with some of US dollar appreciation. President-elect Trump talked often about fiscal expansion but did not provide many details on what that might look like. One benchmark might be Secretary Clinton’s proposed plans. She spoke about $275 billion of spending, which alone is a huge number, but in the context of U.S. GDP ($19 trillion) is not all that big. In addition, that money would be spent over five years, which amounts to about 0.3% of GDP per year. At the same time, state and local governments are reducing their own investments due to budgetary pressures. Given these factors, we believe that net total government spending will grow over the next couple of years, but not by an eye popping number. Nonetheless, this could be boost to GDP, albeit a small one. What’s more important, as it relates to policy, is corporate tax reform. President-elect Trump spoke passionately about the need for corporate tax reform, which is long overdue. The last time that the U.S. had comprehensive reform was 1986. President-elect Trump indicated his intention to reduce the headline corporate tax rate from 35% to something closer to 15%. Most people, however, believe that something closer to 20% is possible. This change would have a number of implications, the largest of which would be hundreds of billions of dollars being repatriated, similar to what happened following the 2006 Homeland Investment Act. This influx would leave many companies awash with cash and, given that they need less of it to generate a dollar of revenue today, it would likely boost the levels of dividends, buybacks and debt reduction. Antitrade sentiment was a recurring theme of presidential campaign rhetoric and President-elect Trump’s voice was often the loudest. He maintained that trade agreements typically result in fewer jobs and lower wages for U.S. workers. Historical evidence suggests otherwise, as we detailed in our paper The Case for Trade Remains Overwhelming (May 2016). Global trade, despite some of its failures, has delivered remarkable returns to investors over the past 30 years, particularly equity investors. So, it’s hard to see how blowback against this investor-friendly policy can be good for investors. We acknowledge, however, that with globalization, there is often a proportion of the labor force that is hurt profoundly. Further, the U.S. and other developed markets have not done a good job of working to help these people through skill training and income support. Even before Trump’s election, protectionists had already succeeded in beginning to turn back the globalization clock. Over the past eight years, protectionist policies have expanded globally and, in our view, this proliferation has helped to bring about the longest period of trade stagnation since World War II. The election of Mr. Trump will likely to extend this period, and the degree of further stagnation depends on what his intentions are in terms of renegotiating or canceling existing trade pacts such as the North American Free Trade Agreement and in increasing tariffs against countries such as China and Mexico. Such outcomes could trigger renewed global trade spats, with a detrimental impact on the global economy and financial markets. Further, the chances of ratifying trade agreements that are now being negotiated, such as those with Asia or Europe are extremely unlikely. While an environment of low growth and low inflation is not great for financials, we are likely to see short rates, and possibly long rates, go up, as mentioned. This would create a mild tailwind for the financial sector. More importantly, the Trump administration will be less inclined to introduce the types of regulation on the sector that Secretary Hillary Clinton intended to enact. This is particularly true in relation to systematically important financial institutions. In addition, the sector appears cheap, especially some of the smaller regional institutions. Ultimately, however, for robust strength in the sector we need to see strong loan growth, particularly commercial and industrial loan growth. We have been seeing some signs of that, but the outlook does appear to be uncertain. Health care will remain a deeply divisive issue. President-elect Trump has been a harsh and caustic critic of the Affordable Care Act, but has not been clear on what he would like to replace it with. He has spoken quite a bit on the other issue facing the sector, pharmaceutical pricing. Based on his comments, it is likely that there will be interventions from a Trump administration, but they will less harsh than what we would have seen from a Clinton administration. This could be considered a positive for the sector, but negative public sentiment and growing competition within the industry will make it difficult for companies in that space to raise prices. In our minds, though, the re-rating that the sector has experienced appears to be overdone. The sector looks cheap and it does possess solid cash flow growth potential going forward. President-elect Trump feels strongly about the energy sector and thinks that a friendlier regulatory environment can help the sector grow and create jobs. Support for the sector will likely increase the supply of U.S. oil. This will have the effect of creating domestic jobs and pushing down the price of WTI.. Despite the increased risk and uncertainty created by this election and potential growth stimulating policy initiatives, our core outlook remains unchanged. Growth is likely to remain in a lower 2% range than its historic 4% range for the foreseeable future. As quantitative easing winds down and rates rise, the support for PE expansion will diminish. With stagnant or contracting PE multiples the other two components of equity return, dividends and earnings, will become more important for investors. The companies that will do well are the ones that generate cash flows and are prudent in their capital allocation policies, as reflected in shareholder yield and capital investment opportunities. As we have said many times, the value of a company is driven by its cash flow.